Famous Footwear is the world leader in shoes, offering everything from casual shoes to dress shoes, knee high boots to riding boots, and footwear for men, women, infants, children and teens! Shop their complete range which spans over 200 brands including Bearpaw, Birkenstock, Skechers, Minnetonka Moccasin and their own house brands Naturalizer, Dr. Scholl's Shoes, LifeStride, Franco Sarto and Ryka. Famous Footwear Discounts on popular brands at Famous Footwear! 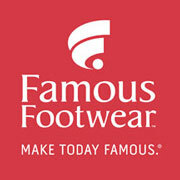 Famous Footwear Get 5% off your next shoe purchase by joining the mailing list! Do you love Famous Footwear? Shoebuy.com Get Free Shipping and Free Exchanges on All Handbags!